Heat oven to 350°F. In small skillet, heat 1 teaspoon oil over medium heat. Cook 1 cup onion in oil, stirring occasionally, until tender. Remove from heat; cool. In large bowl, mix onion and remaining meatball ingredients just until combined. Shape into tablespoon-size meatballs. Place in ungreased 15x10x1-inch pan. Bake uncovered 15 to 20 minutes or until no longer pink in center and meat thermometer inserted in center of meatball reads 160°F. Meanwhile, in Dutch oven or large saucepan, heat oil over medium heat. Cook 1/2 cup onion in oil, stirring occasionally, until tender. Add garlic; cook 1 to 2 minutes longer. Add tomatoes, tomato paste and salt. Cook 5 minutes, breaking up tomatoes. Add cooked meatballs to sauce. Simmer 10 to 15 minutes, stirring occasionally, until sauce is thickened. Prepare and bake meatballs as directed—except do not add to sauce. Cool meatballs. Place in resealable freezer plastic bags or freezer container; freeze 2 to 3 months. Freeze sauce separately. When ready to use, thaw in refrigerator overnight. 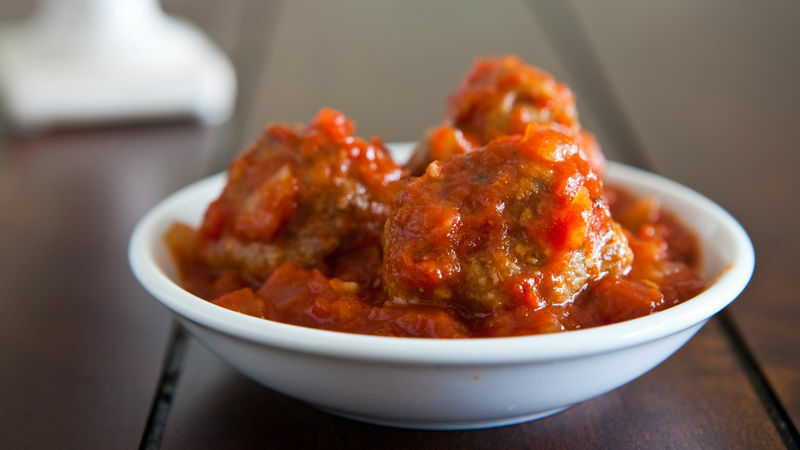 In Dutch oven or large saucepan, reheat meatballs in sauce 15 to 20 minutes or until thoroughly heated. Serve the meatballs and sauce on spaghetti with a sprinkle of Parmesan cheese, or make meatball sandwiches on hoagie buns topped with shredded mozzarella. To lower the fat content, use lean ground beef and lean Italian turkey sausage. These meatballs can also be made with all ground beef. This authentic Italian meatball recipe—complete with marinara sauce—would make your great-grandma proud. Serve them over pasta with tons of Parmesan cheese on top, or toast some hoagie buns and make meatball subs with, you guessed it, tons of Parmesan cheese on top. Mangia!